Perhaps we are mad, I wonder, staring at my numbing thumb. Cars swoosh by, slooshing snow onto our packs, propped up beside the icy road. It’s the middle of December and we’re taking the longest road possible from the North-East to the South-West corner of Anatolia, through East Turkey, or North Kurdistan, or Western Armenia – depending on who you’re speaking to. We have more luggage than I’ve ever carried and we’re taking this road purely because I have never taken it before. The road brushes against Turkey’s closed border with the modern state of Armenia, touches the edge of Iran, and curves round Lake Van, before nudging Syria on its way West. The first time I came to Kars, I knew little of her history. She is the coldest city in Turkey, and star of a terribly written book by Orhan Pamuk. But there is an older story still. 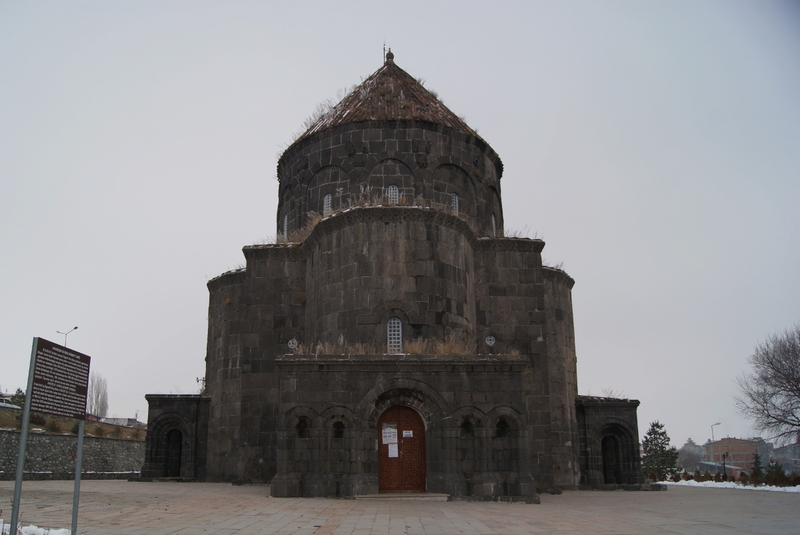 Once upon a time, Kars was capital of the medieval Bagratid Kingdom of Armenia. Later, she was victim of a tug of war between the Ottoman and Russian Empires. She has been Byzantine, Seljuk, Georgian, Russian, Ottoman, Armenian and Turkish. The beauty of Kars to me is that she is so very different from anywhere else. I take H to see the old Armenian church, which, like the rest of the city, has suffered something of an identity crisis. What is now the Kümbet Mosque was originally the Holy Apostles Church, first converted into a mosque in 1579. It has since been a Russian Cathedral, a mosque again, then an Armenian church, later a museum, and is currently a mosque. A plaque outside informs us it was built in the 10th century by King Abas I. Interestingly, it doesn’t mention that the king was Armenian. I will later learn from an article in ianyan Magazine that the word “Armenian” is banned in official tourist literature in Turkey. Kars is bleak enough in winter, but Ani huddles at the end of an almost empty 45km road in the coldest corner of Anatolia, just out of reach of the closed Armenian border. It isn’t easy to get to Ani, especially in winter, but somehow we track down the only daily dolmuş and arrive with an hour before dark. Once capital of the former Armenian Kingdom and home to a whopping 100,000 – 200,000 people, now, she is rubble, ruins and the remnants of etchings. 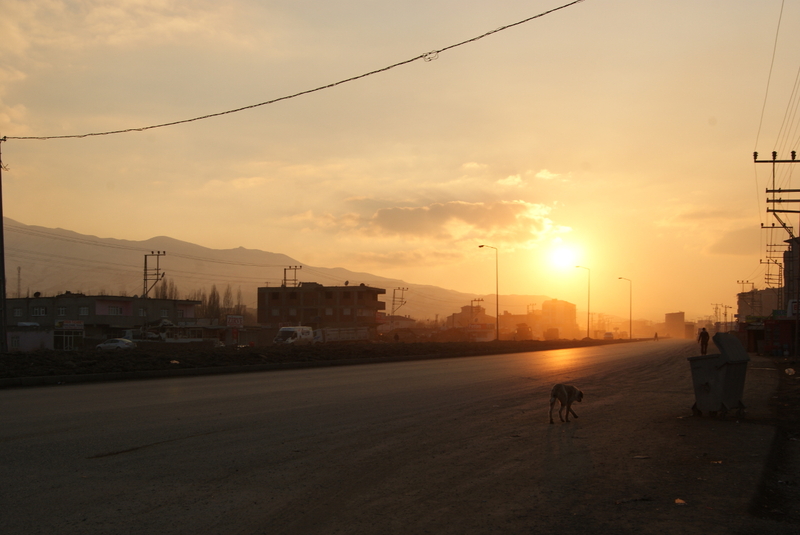 We follow the road slowly, doubling back on the other side of the border to Armenia, where we left over a week earlier. If the border hadn’t been closed by Turkey in 1993, we could have arrived from Yerevan in a matter of hours. We are now on the other side of Ararat. 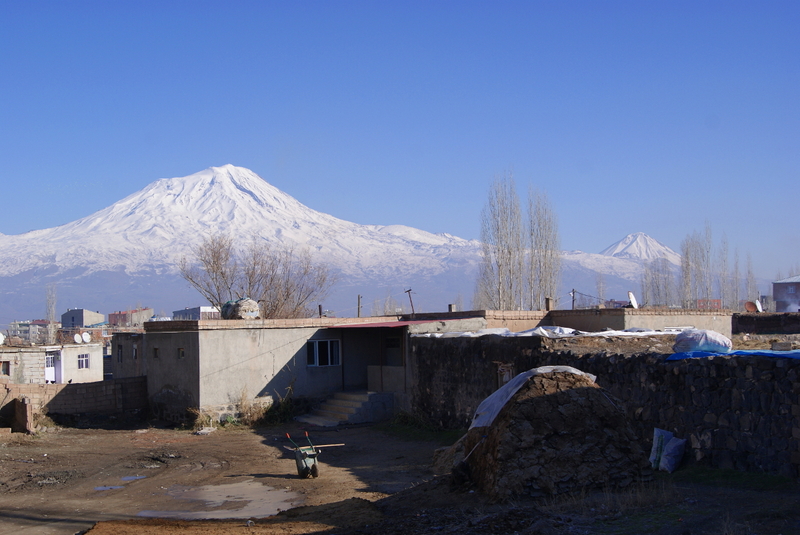 The mountain is of semi-mythical importance to Armenians. Legend has it that Noah’s ark came to rest atop the, and the Armenian people are his direct descendents. When Turkey took the mountain, it broke a lot of hearts. 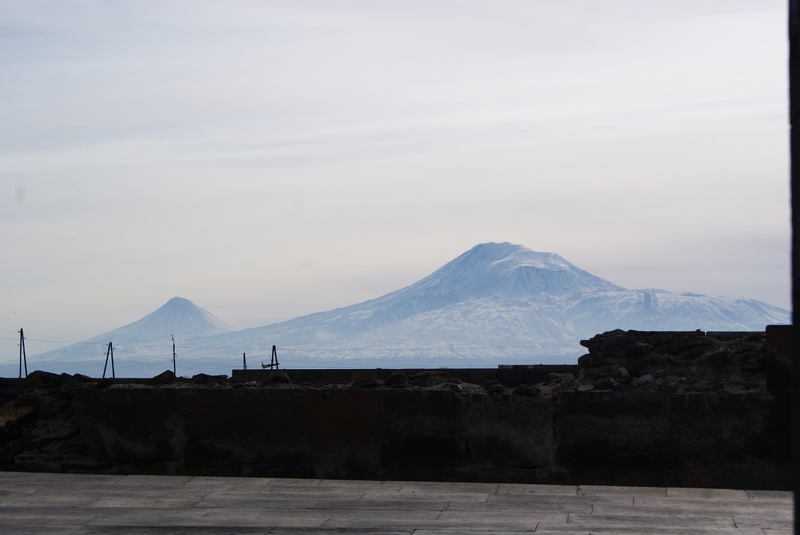 We’re used to Ararat looming over Yerevan, little Ararat to the left of the big one. Now we’re on the other side, it seems the world is reversed, as though we’ve entered some kind of dreamlike mirror universe. with our first of many Kurdish drivers. Van is a thoroughly modern University city in comparison to Doğubeyazıt and the villages behind us. We are stay with the friend of a friend’s friend, who takes us out for the legendary Van breakfast. H and I wander the streets of Van and walk directly to an un-signposted museum in a backstreet, as though drawn there. A note on the door says it’s been closed since the devastating earthquake of 2011, but the front gate is open, and there in the garden is a huge aray of ancient tombstones. Armenian letters, symbols and crosses are etched into most of them, while others have Arabic letters, which could be an older form of Arabic, Turkish from before the lettering system was changed, or could date back to Persian times. Many even carry the older, cuneiform alphabet used by the Urartians, who pre-date the Armenians. 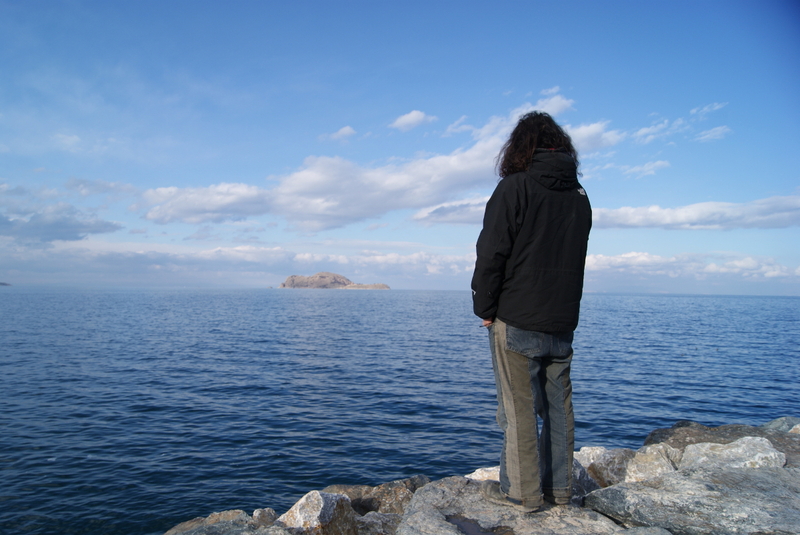 The city of Van perches at the edge of Lake Van. Like Kars, Van changed hands several times between the Russian and Ottoman Empires. After the Turks took back the city for the final time, they killed all Armenians in the city, reportedly around 55,000. 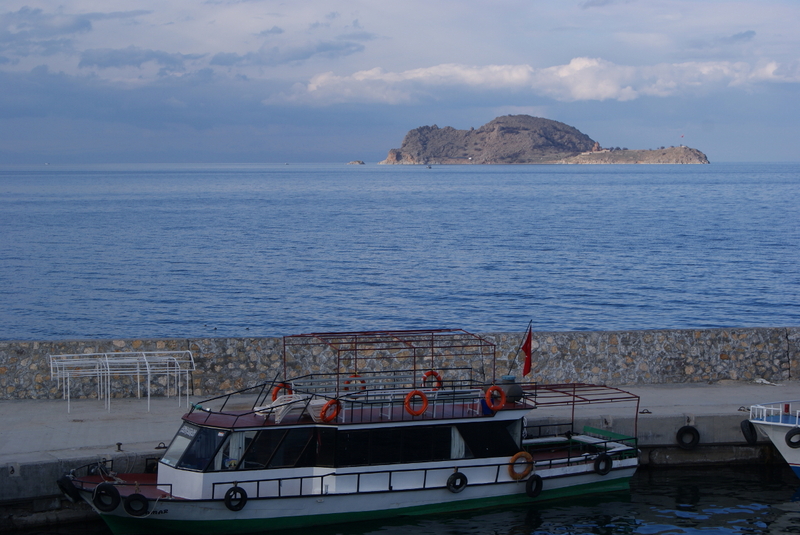 Lake Van carries three islands, including Akhtamar. The name was changed to Akdamar, meaning “white vein” in Turkish, as part of the Turkification process. The older name comes from an Armenian legend. The Church of the Holy Cross still stands on Akhtamar, just visible from the South bank of the lake, where we arrive by dolmuş. From here, boats ferry tourists to the island and back. There’s only one problem: it’s the middle of winter, no tourists. We wait for an hour, but nobody comes. Only a cat with too much fur and an eye infection. She hisses at us. The following day there’s a snowstorm. We huddle by the same bank of the lake with cold thumbs aloft, the island no longer even visible. An enthusiastic Kurdish driver regales us with an endless stream of Kurdish history, in Turkish. I try to follow the conversation as best I can, which is only really possible because I already know most of what he’s telling me: the Kurdish people have long been oppressed by the Turkish state. Their language was forbidden for a long time, and so not only were they not allowed to learn Kurdish at school, most people stopped speaking it at home. I have read about the fines that were levied during the Citizen, Speak Turkish! campaign. There are now two generations of people who have grown up without speaking Kurdish. It seems Armenian history is not the only one being erased from the map in this part of the world. We arrive in Diyarbakır, capital of North Kurdistan, and considered the seat of the PKK and wider Kurdish separatist movement. 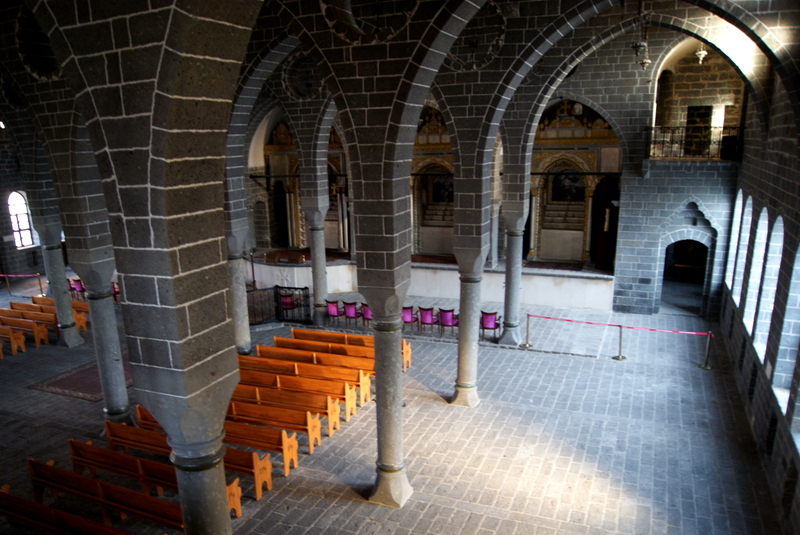 There is still a tiny Armenian community in Diyarbakır, that somehow survived the genocide. The vast majority have Islamicised and non speak Armenian, for much the same reasons that few speak Kurdish in these areas. In memories of our roots living in this land since thousands of years. 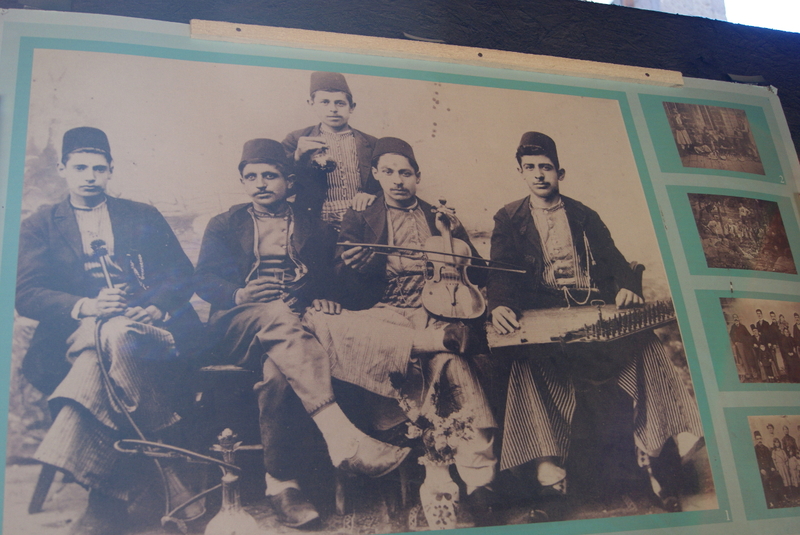 Boards display photos of the Armenians in Diyarbakır prior to the genocide. Armenian merchants and craftsmen had an important place in the economic life of the city. Copper works, jewellery, leather works, fabric and carpet weaving were among the occupations in which Armenians were advanced. I realise suddenly that it’s the 24th of December, and we’re in church. I’m not in the habit of admiring churches, but there’s something very touching about this piece of resurrected history, and the slither of culture that survived such devastation. Anyway, Armenian Christmas is on the 6th January, not for a couple of weeks yet. This is our last stop in Ancient Armenia, but our steps into the heart of Kurdistan have barely begun. 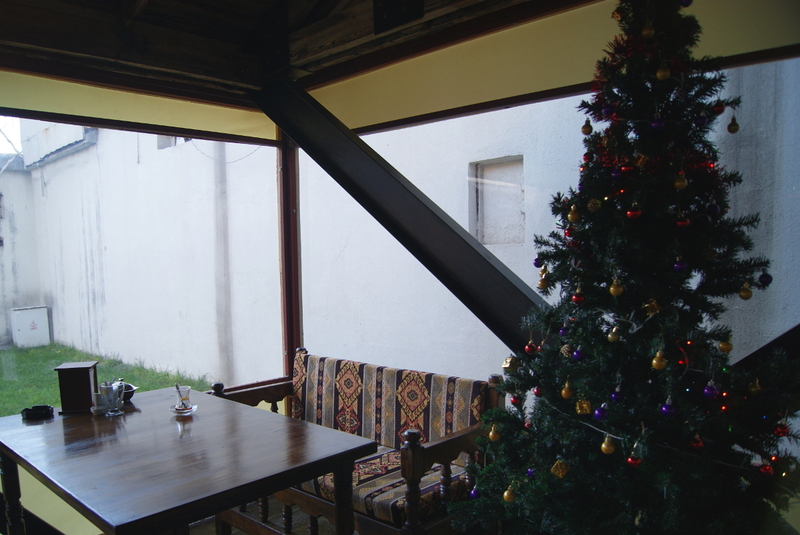 ← The Worst Hostel in Tbilisi? Jo, thanks for the interesting post and photos… you make me want to visit this region… any season, except Winter. How is Diyarbakır the South-West corner of Anatolia? Next posts will show further movement towards the actual South-West corner, where we’ll end up in Marmaris.